Dozens of far-right supporters and ultra-leftists taking part in "yellow vest" protests fought with fists, rocks and sticks in the eastern city of Lyon at the weekend. 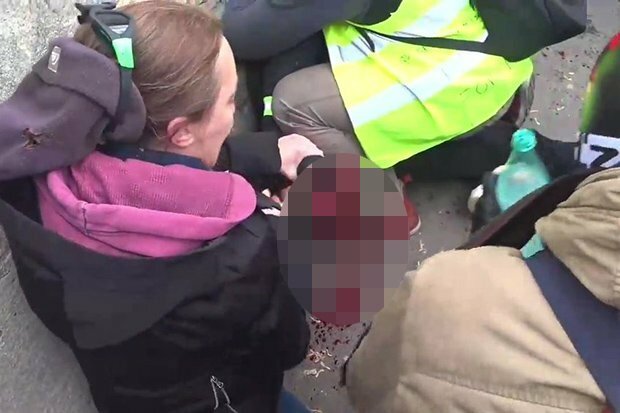 A "yellow vest" protester in France had his fingers ripped off during violent clashes at the Parliament building in Paris, as the anti-government protests entered its 13th week, the media reported on Sunday. Eight police officers were lightly injured during clashes with protesters in Bordeaux. At least 10 protesters were arrested after scuffles broke out with police near the Palais Bourbon, where the National Assembly meets. Witnesses told the French AFP news agency that the man's hand had been torn apart when flash-ball grenade exploded. In the south of France police blocked yellow vest leader Maxime Nicolle from crossing into Italy to join forces with Italian demonstrators. The number of protesters has ebbed considerably since the first Yellow Vest demonstrations in mid-November 2018. The Yellow Vest protests, which started late previous year, began as a movement against Emmanuel Macron's proposed fuel taxes. Rival groups, who were supposed to be united in protest against president Emmanuel Macron's government, were filmed battling each other in Lyon on Saturday.